Select the number of loops (also referred to as "teeth") that you need. You need one loop for ever hole that is punched in your pages. The minimum number of loops is 8 for custom cut orders. Do you need custom sized twin loop wire binding elements? 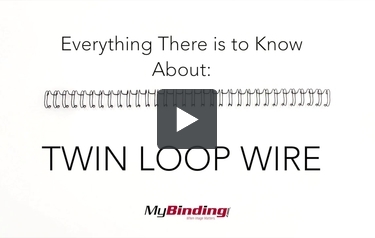 At MyBinding.com, you can order any size of twin loop wire in any length. Simply specify the size, number of loops, and color. Now you can easily order wire for calendars, legal sized documents, half sized books, and other non standard sized documents. Custom cut twin loop wire is priced per 100 pieces and is made to your specifications. The best way to determine the correct number of loops for your document is to punch a test document and count the number of holes. This product takes approximately 3-5 days to ship, if you need your product faster please contact our customer service department to explore options for expediting your order. If you need help determining the correct number of loops for your book or need a size or color not listed here, please contact us at 1-800-944-4573. Great products. Reasonably priced!!! Good customer service. These wires have a professional look for our planners. It is so great to be able to get them cut to size for a junior size planner. Typically they are shipped fairly quickly. This last order did take a bit longer... but wouldn't buy any others. It was probably just a glitch. Having these custom cut for my job is so convenient. Just wish they came in silver. As expected, in the length and capacity needed! Although it was a custom cut and not a stock size- I appreciate the guidance provided by the customer support as well. Easy to order and exactly what we needed, thanks! Working with MyBinding is so easy and their products always give our projects a very nice and professional look! Thank you! This is the only place I have been able to find legal sized wires for my machine. I buy 41 loops for 14 inch binding and they work great. Can I order wire in a customized pitch or only the 2:1/3:1 pitches at custom lengths and diameters? Thank you for your question. Unfortunately there is not a option for a custom pitch of wire. Twin loop wire is only available in either 2:1 or 3:1 pitches. Are the twin bind the same type of product from GBC. And do you offer them in a different color, we are looking for them in Gold? Thank you for your question. The Custom Cut Twin Loop Wire Elements would be compatible with any brand of Twin Loop Wire machine. You would need to be sure to select the pitch that matches your machine. Pitch describes the spacing of the holes. 2:1 will have 2 holes per inch and 3:1 will have 3 holes per inch. The supplies are not compatible. Unfortunately the Custom Cut Twin Loop Wire Elements is not available in gold. We have Twin Loop Wire available in standard letter size lengths available in gold here . Is this product Made In The U.S.A.? Thank you for your question. The material for the wire is imported by the manufacturer but the Custom Cut Twin Loop Wire Elements are cut to order by the manufacturer, which is located in the USA. how many pieces are in the package? Thank you for your question. The Custom Cut Twin Loop Wire Elements come 100 per box. Thank you for your question. The Cinch uses a propriety wire that may have a non-standard pitch ( hole/loop spacing). We have standard 2:1 and 3:1 pitch wire. Before ordering custom wire as they are not to be returned we would suggest contacting the manufacturer of the Cinch to find out is a standard pitch wire would work with their machine. Thank you for your question. Unfortunately the custom cut wire is only available in quantities of 100. Thank you for your question. When selecting the size for a custom length of wire the best way to do it is to bunch a sample and count the holes. That way you can ensure that you get the correct length of wire because as a custom made item they are not returnable. Be sure to select the correct pitch of wire so the spacing on the holes is correct. For custom cut wire it is best to punch a sample and count the holes to determine the # of loops. The number of loops along a page edge can vary depending on the length of the edge and placement of the holes.